While traveling in a runabout, Bashir (Siddig El Fadil) and Kira (Nana Visitor) respond to a distress call from a disabled Kobliad ship. 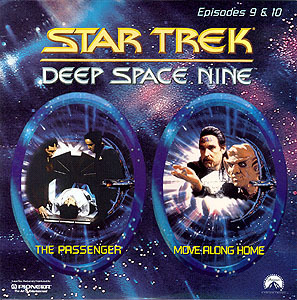 When they beam over, Bashir is attacked by an injured passenger - a murderer named Rao Vantaka (James Harper), who suddenly dies. Back aboard Deep Space Nine, the Kobliad security officer Ty Kajada (Caitlin Bloom) insists on an autopsy to prove Vantika, who has a history of faking his own demise, is truly dead. Meanwhile, the crew determines that Vantika was probably coming to the station to hi-jack a freighter carrying deuridium, a rare substance that prolongs Kobliad life. 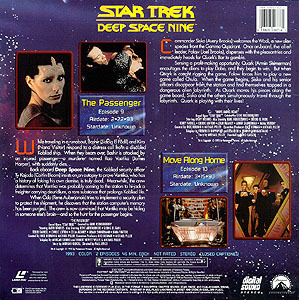 When Odo (René Auberjonois) tries to implement a security plan to protect the ship, he discovers that the station computers memory has been purged. The crew is now convinced that Vantaka may be hiding in someone else's brain - and so the hunt for the passenger begins. Commander Sisko (Avery Brooks) welcomes the Wadi, a new alien species from the Gamma Quadrant. Once on board, the alien leader, Falow (Joel Brooks), dispenses with the pleasantries and immediately heads for Quark's Bar to gamble. Sensing a profit-making opportunity, Quark (Armin Shimerman) encourages the aliens to play Dabo, and they begin to win. But when Quark is caught rigging the game, Falow forces him to play a new game called Chula. When the game begins, Sisko and his senior officers disappear from the station and find themselves trapped in a dangerous alien labyrinth. As Quark moves his pieces along the game board, Sisko and the others simultaneously travel through the labyrinth. Quark is playing with their lives!